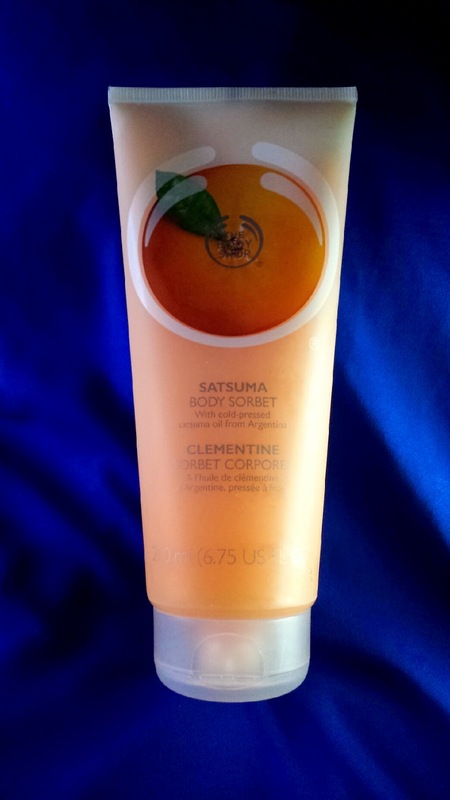 On my most recent visit to The Body Shop, I was so excited to finally pick up a Body Sorbet! I have been eager to test them out since I first heard about them. 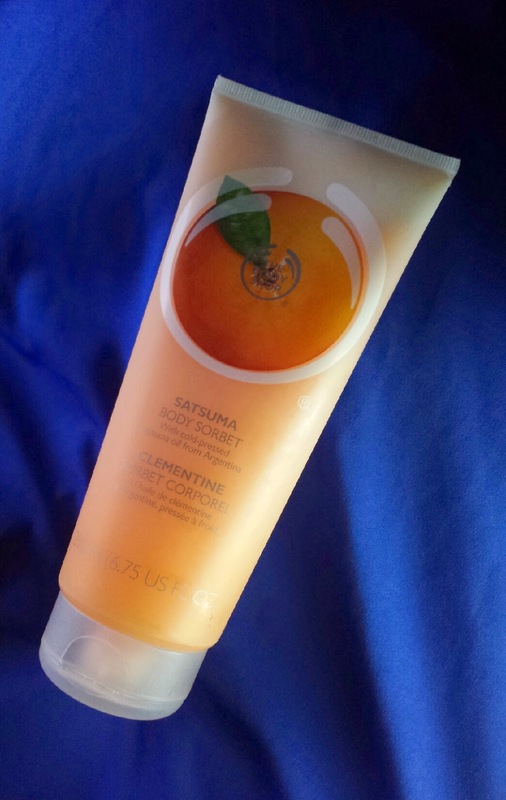 Upon purchasing myself the Satsuma bottle, I was also provided with a sample of the Vitamin E Aqua Boost Sorbet. Therefore, whilst I don’t have any interesting photographs of the Aqua Boost Sorbet (unless you would like to see my translucent sample pot! ), I have tested it out. 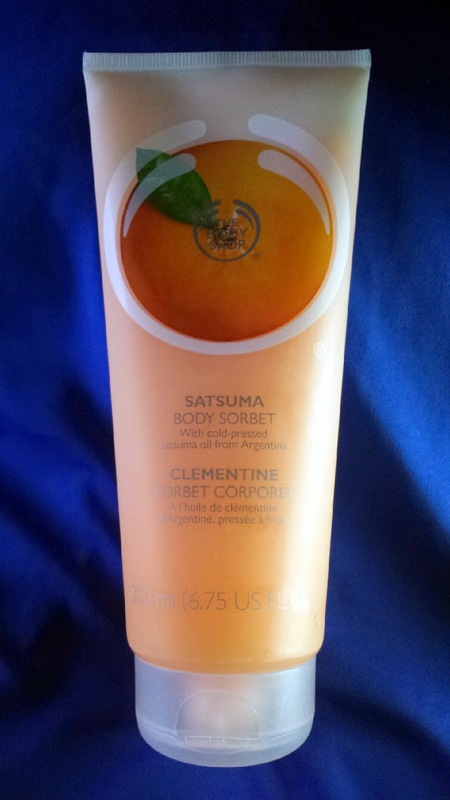 The Body Sorbet comes packaged in a tall tube that holds 200ml of product. The tube is slightly matte which creates a frost effect, clearly to add to the frosty theme of the sorbet. The end of the tube has a flip cap for the moisturiser to come out of. It’s difficult to decide whether I should be calling this product a cream or a gel. It is definitely a unique texture that can honestly only be described as a sorbet! If you have had sorbet before then you will recognise that smooth yet frosty texture instantly. I have to apologise as well for the overuse of the word ‘frosty’ in this review. It’s really hard to find a different word as it just fits so perfectly! The colour of the sorbet corresponds to the scent. In my case, the Satsuma sorbet is orange. Upon applying the moisturiser, you will begin to feel the cooling sensation straight away. Whilst it isn’t super intense (unless you refrigerate the bottle first), it is refreshing enough to make you smile as you apply it! Especially if you apply it straight after a bath or shower, the cooling sensation really kicks in after a few seconds and seems to grow a little stronger as you exit the bathroom, hitting less humid air. The sorbet absorbs very quickly, which is always a plus, especially if you’re busy! Not only that, but the smell is really intense and you can smell it on your skin for a good few hours after use. In addition to that, your skin is left feeling pretty soft and hydrated. Whilst not being the most intense moisturiser that I have ever used (look towards The Body Shop Body Butters for more intensity), it’s the perfect level of moisture and hydration in weather like we have been having recently. In the hotter months you simply don’t need a heavy moisturiser, and this one provides just the right amount with that extra treat of refreshment! 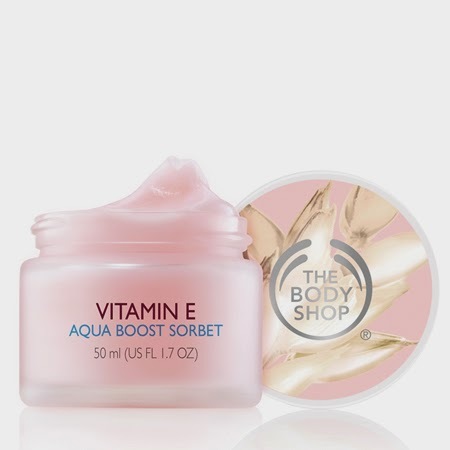 The Vitamin E Aqua Boost Sorbet comes packaged in a small jar that contains 50ml of product. It has a screw lid to reach the sorbet, which is pale pink in colour. 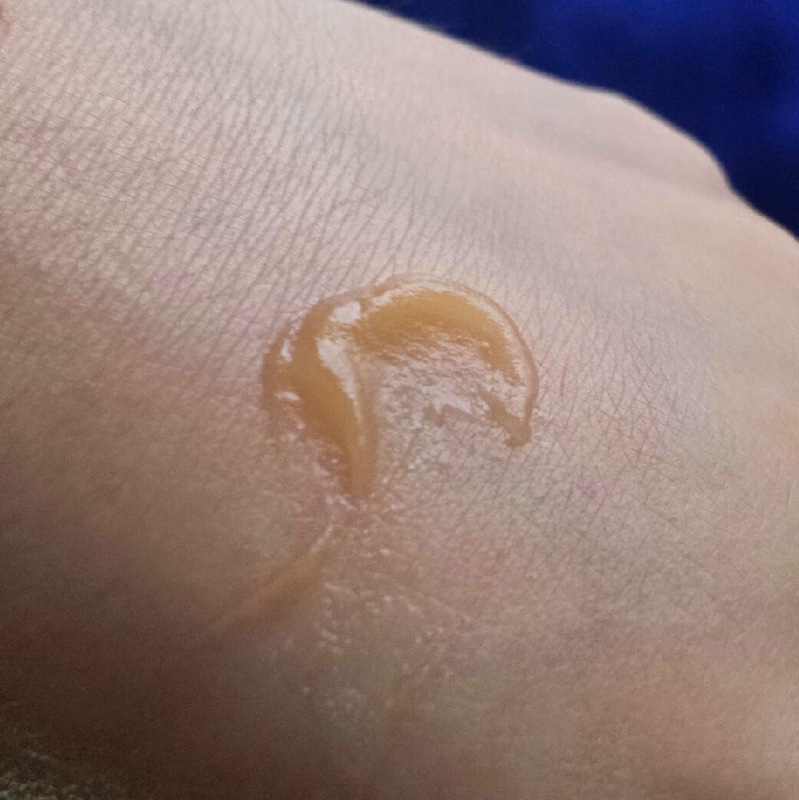 This moisturiser has a fresh whipped feel to it. If you think to the lightness of a mousse based foundation, it is sort of like that, but at the same time it is like touching a room temperature sorbet. Very interesting and it works very, very well! Applying this facial moisturiser is just like with the Body Sorbets. 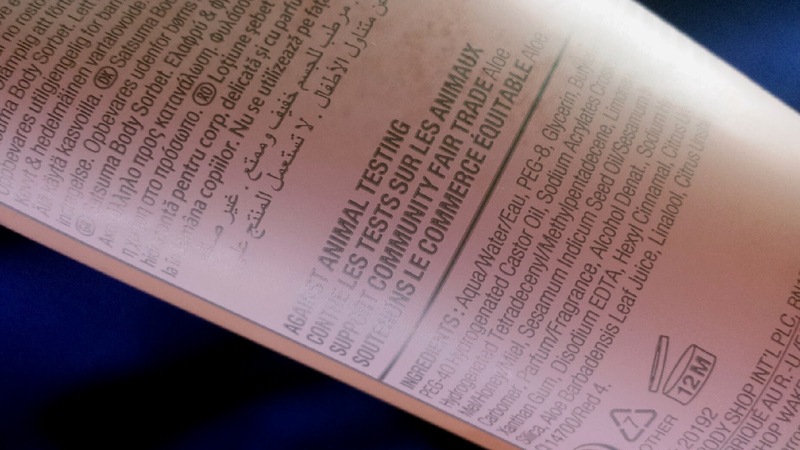 Upon application, the moisturiser unleashes its cooling sensation, providing you with that fresh blast of hydration. I have found that the Aqua Boost Sorbet leaves a cooler sensation behind than the Body Sorbet. However, I haven’t yet tried either after being refrigerated, so whether that is the same for their refrigerated selves then I cannot yet say. I will look into this! The best thing about this moisturiser though is the fact that it leaves your skin feeling very velvety to the touch. I have oily skin so I am pretty wary about what moisturisers I use, but this absorbs really quickly and leaves a semi-matte look on my skin. It doesn’t turn my skin greasy throughout the day either, which is fantastic, but it doesn’t prevent it from turning shiny outside of the same time period as my skin usually does. So whilst it doesn’t aggravate my oily skin, it doesn’t counter it either. However, the hydration that this moisturiser provides is beautiful. My skin feels so comfortable after applying this as well as velvety soft. It’s perfect to apply underneath your makeup as it gives you a good base (I still use primer though!). If you have oily or blemish prone skin and have been wanting to test out a product from the Vitamin E range by The Body Shop, I definitely recommend this one. I have tried the Vitamin E moisture cream and whilst I do honestly see why people love it, it just didn’t work with my oily skin. The Aqua Boost Sorbet does. Overall, I really like the new sorbet additions to The Body Shop. They’re the perfect products to invest in whilst we are enjoying the rare bit of hot weather, and are also great to re-apply throughout the day for an extra boost of refreshment! The idea behind these moisturisers could easily have fallen under the category of "gimmicky," but I was very happy to see that the results were behind the formulas and they aren't just useless products that deserve credit purely from a marketing perspective. The Body Shop currently have a great variety of products available. They honestly seem as if they are anticipating and keeping on top of the little demands from their customers and providing such a choice that it is difficult to claim that you can't find anything suited to you. If you prefer oil based moisture, The Beautifying Oils are at hand. A more intense moisturiser? The Body Butters. 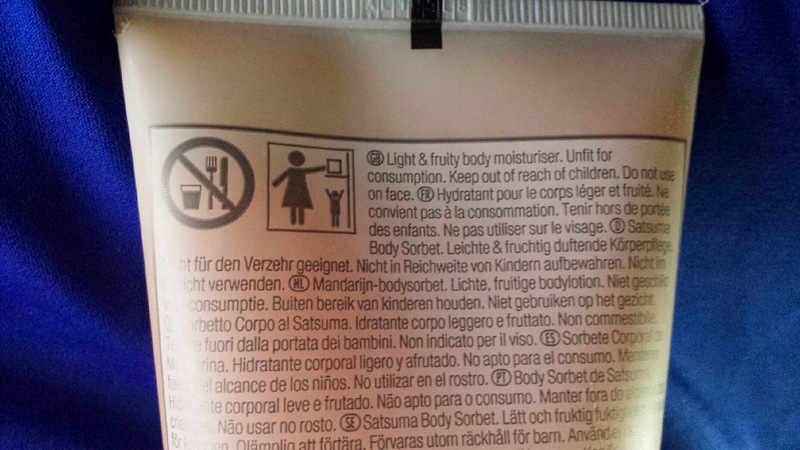 A light moisturiser that helps to give a cooling refreshment? Well, here we go. The Body Sorbet is available for £8 and the Aqua Boost Sorbet is £12 and both are available from The Body Shop. Have you tried the new sorbets? What is your favourite Body Shop scent?